In a heavy pot combine the butter, MimicCreme, sugar, and salt. Bring to a full boil over medium and boil for three minutes. Check the fudge using the soft ball test. If it doesn’t form a ball, then cook for another 30 seconds and try again. It may take up to an additional 3 minutes of cooking. Remove from heat and stir in the melted baking chocolate, chocolate chips, vanilla, and marshmallow fluff. Stir and blend well. If adding nuts or peanut butter, also stir them in. Pour into a greased (butter or margarine) 8 inch square baking dish and chill. 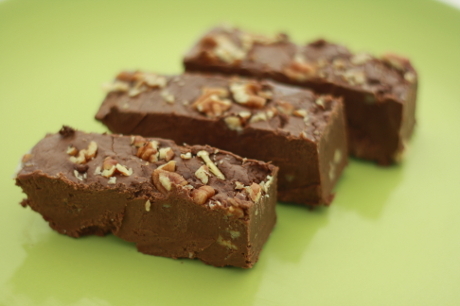 5 Responses to "Gluten Free Dairy Free Fudge"
Did you make this without the nuts and peanut butter and if so was it still tasty and a good texture? We left the peanut butter out of some and it was really good! I’m sorry it doesn’t help you, since you can’t have the mimiccream. Also, what is in Mimiccreme and where do you purchase it? Harvest Health? Never mind. I see it is made with nuts so we can’t use it. Will pass on this recipe for now unless you think it would work fine with rice milk but most likely the consistancy wouldn’t be right? I made one using coconut milk, but it never got very firm so I wanted to try it again using more sugar and the soft ball method to see if that will help. I see there are a few recipes online using rice milk so I’ll experiment with those and see how it turns out.